It's only been a few days but we've been back to Happy Mount Park already! What can I say, we love it here! This time we went with my Dad and Fay, again we've left Hubby at home to get some rest. This time this boys were itching to get up to the large wooden adventure area at the back of Happy Mount Park where we hadn't made it with Mum. They had a blast! They love the large sand pit and spent ages digging and rooting through it searching for "treasure", Tom was delighted to discover he could climb sections he was too small or nervous to get up by himself last time he played here, and Jack found he could jump and scramble further too. Georgie is still too small for this bit of the park, but he was perfectly happy digging with Mamee in the sand! Jack has discovered he can use the zip line now too. Last summer he was still a bit small and not quite strong enough to cling to the bar but now he has it totally sussed and was zooming down it over and over again. Dad kept an eye on him because there were plenty of other kids playing with it too and he was expecting some disagreements over whose turn it was - but there was nothing of the sort. Kids were bringing the bar back for the next kid in the queue. 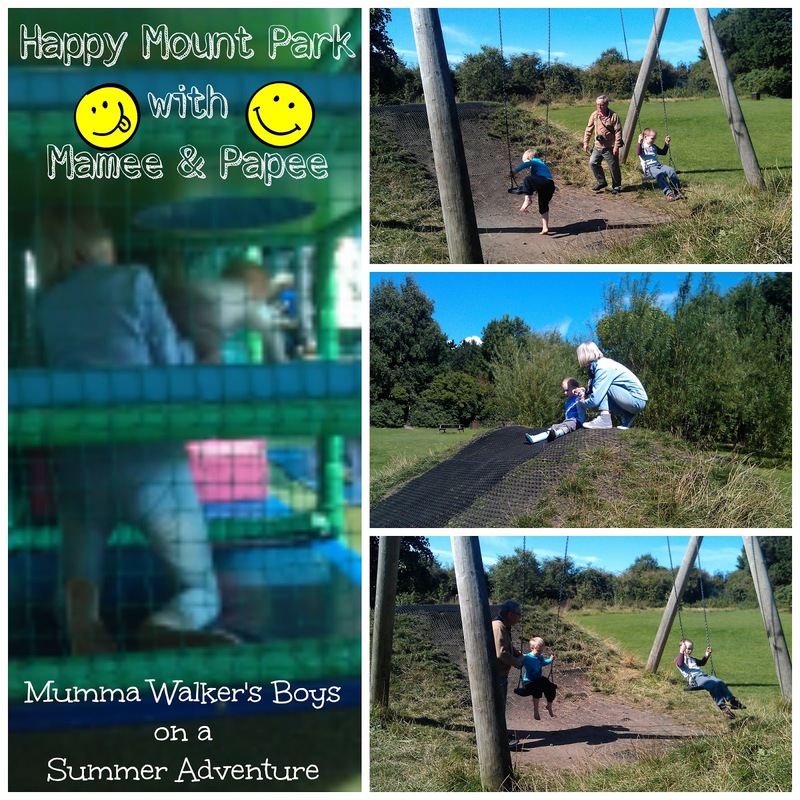 The boys convinced Mamee & Papee to take us to the Cafe for lunch and a play in the Pirates Park again, and Georgie had Fay lift him up to the higher sections of the soft play area when his big brothers "banned" him from the bouncy pirate ship. Although to be honest I think she quite enjoyed it really! These kids have my parents & step parents totally wrapped round their little fingers, hee hee!